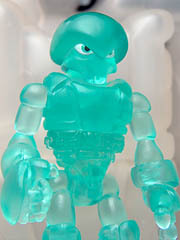 To the left, you'll see a thumbnail from Friday night's big Onell Design Glyos Drop! The May 25, 2012 offering (and prices) are preserved for future generations, or people writing reviews who were wondering "So what did that cost again?" The Onell crew also posted a great update about the new figures, including some cool commentary about where a certain shade of green came from. Which I didn't see before I placed my order, and I'd have totally bought the completely appropriately named "Remnant Pheyden." I swear, Matt's a genius. Check 'em out, and then cry because you missed them! Click here to see what's left. The next drop is incoming! Just under 30 awesome clear colored and colorless items will be available Friday, May 25 2012. 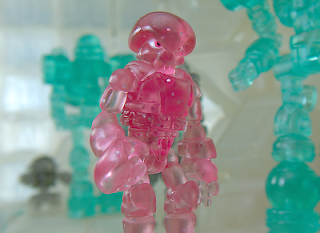 Highlights include clear Travelers and Glyans, some unpainted Crayboth fellows, and a ton of clear vinyl. (Be sure to read up on why this may be the last of it for a while.) Almost all items plus a price list may be found here. 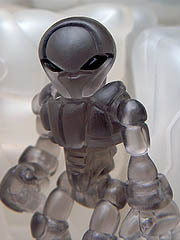 In the post "Darker Things," we get another glimpse of an upcoming Onell Design Glyos figure. The Clear Smoke Sarvos should be in the next batch of figures, coming later this month! A clear colorless Armodoc and a superb Neo Voss Pheyden are just two of the figures being teased for a late May drop at Onell Design! Check out this entry for some pictures and backstory on a couple of the releases, and this one brings you some fun with the Phaseons. Start getting excited! All-around nice guy and friend to things that are great Jason Ho drew this swell Scar Pheyden artwork which seems like it would make a great t-shirt. I'd wear one. Who can make this happen for me? 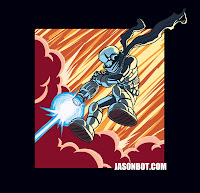 Be sure to check out the full art at Jasonbot.com. He also has a really cool Battle Beasts drawing.